The martial arts offer an age-old perspective on something critically important to your shooting performance – reaction time. Employing a punch, a round kick, an edged weapon or a firearm in self-defense means that you’re reacting to a rapid and dynamic escalation of force. Your objective is to stop or gain control of that escalation. The single most important factor in meeting that objective is time. Both your dearest friend (when in ample supply), and adamant foe (when turned against you), time, in any self-defense situation with or without a firearm, is a double-edged sword. Reactionary Gap, is a term applied to the amount of space at your disposal in response to a real-world active threat. The greater the reactionary gap, the more time you have. The smaller gap, the less time. Physical violence that causes you to go to guns in defense of life or limb, usually means a minimal reactionary gap. Relying on precision shooting when fighting for your life at extreme close quarters, may not be your very best bet. However, having true reactive shooting skills in your tool kit will help make optimal usage of time. 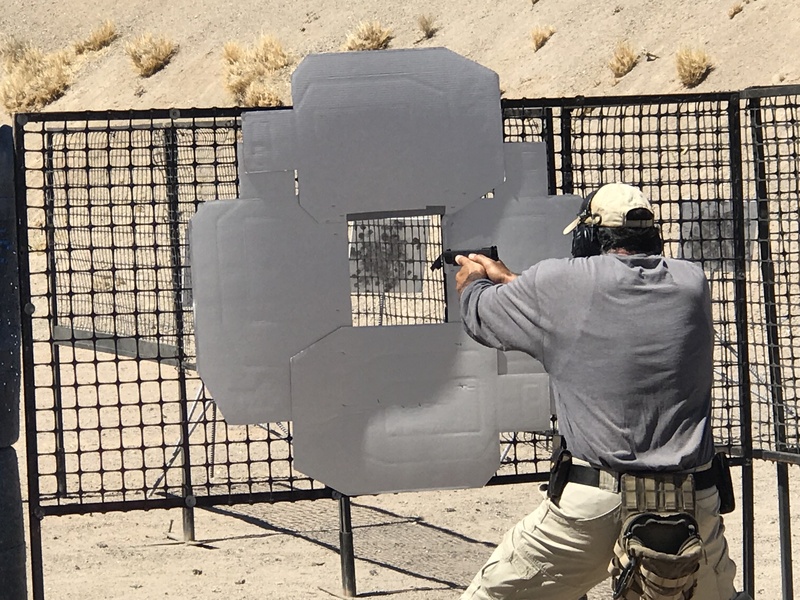 Founded (more than 40 years ago) by former FBI Special Agent and renowned professional competition shooter, Bill Rogers, is a reactive shooting school that trains you to do just that – shoot reactively. If you’re a student of defensive handgun and you’ve never been, the Rogers Shooting School, located in Ellijay, GA, is a very worthwhile training investment. Reactive shooting is unlike any other, in that, just like the real world, you don’t have much time to react. The Rogers system demands alacrity in both effective gun handling and marksmanship. According to Bill, we humans have an average “Unit of Human Reaction” (UHR) time measured to be approximately .25 seconds. It’s the measurable amount of time your computer (brain) needs to process stimulus response. Although the aggregate may be about a quarter of a second, this is a very subjective measurement and can vary from shooter to shooter. One way to find your UHR is to use your shot timer. At your next practice session, face down range. Load up. No target required. Point your muzzle into the berm and take up as much slack in the trigger (if any / as possible) without sending the round down range. With the timer set to random (to provide more of an unknown variable – like the real world), have a buddy hold it to your ear. When you hear the beep, break the shot. Beep – boom, it’s that simple. The time registered between beep (stimulus – your sensory input followed by computer interpretation) and boom (response – signal from your brain box down the neural pathways leading to your trigger finger) is your approximate UHR. Run it several times to find your average. Taking this average as your par time, you can use it to measure that initial critical step (interpretation and processing of life-threatening information) in making rapid and accurate round placement from concealment. Depending upon your skill level, running this drill repeatedly will better familiarize you with operating in fractions of a second and, in the long run, eventually lower your reaction time (UHR). Reducing your UHR allows you to get to your gun faster because it lessens the amount of time required in decision making — which is a significant and contributing factor in the processing time from initial stimulus to response. Given that the purpose of defensive shooting is to make combat-effective round placement in a timely manner when reacting to an active threat, time is not on your side. 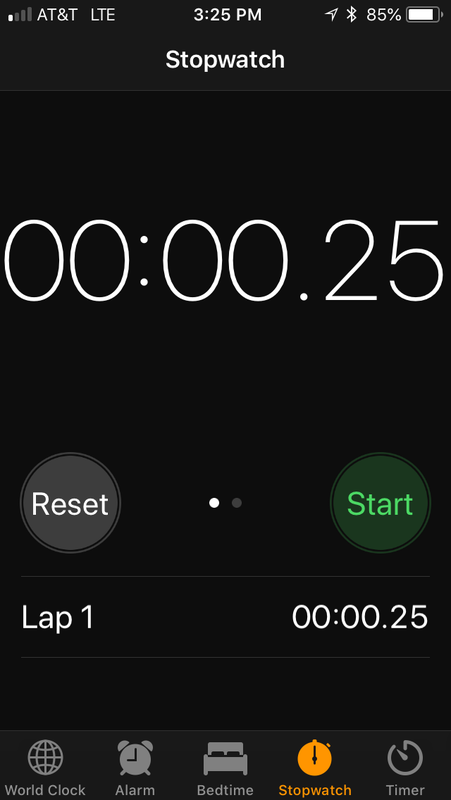 Reducing your UHR by even one tenth of a second shortens your overall time in placing a warranted first round on threat. In addition to using a shot timer at the range, look for and run other “drills” or training opportunities in your day where you may be able to work on reduction of your UHR. Such innocuous training as opening the microwave door during the countdown just as you see the one-second display, but prior to the beep, is a good drill. Another training opportunity is when driving and sitting first in line at a red light. With your foot on the brake and your eyes on the traffic light – not on your cell phone – the split second you see the light change from red to green, move your foot off the brake pedal, faster than you normally would, but with good control to not stomp on that gas pedal. In fact, you want to make very light placement on that gas pedal. This action is similar to getting on your trigger quickly from the holster, in rapid control, but without disturbing muzzle alignment with the target. Using these and similar reactionary gap training drills can help you to continually be cognizant of and work on reducing your reaction times. After a couple of months of running these, remeasure your presentation times. You may be pleasantly surprised with the performance benefits of cutting your UHR. Steve Tarani, is a former CIA protective services subject matter expert who served on Donald Trump’s pre-election protection detail and is the lead instructor for the NRA’s new Non-ballistic Weapons Training program offered nationally to 2.3 million members. Tarani, an active protective agent, is a Central Intelligence Agency and FLETC-certified federal firearms instructor who also provides services for the US Naval Special Operations Command, FBI National Citizens Academy Alumni Association, National Association of School Resource Officers (NASRO), and others.